Parents, Would you like to visit Mudgee’s very famous wineries, go out for lunch or would simply like to spend some quiet time without the children of an afternoon? We offer complimentary ‘Kid’s Club’ every day. 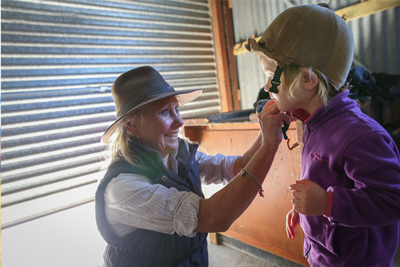 With only two families staying with us at any one time, you can be assured that we will take the utmost care and provide undivided attention to ensure that your children with be safe, happy and personally looked after and supervised by myself and my daughter on our farmstay. I have my child safe accreditation and I am a Justice of the Peace. Kid’s Club is available every afternoon from 1pm to 5pm. Your child/children will enjoy lots of fun and safe activities, while adults take some time out for themselves. All snacks and drinks will be provided as well as supervised baking in the homestead. Complimentary “Kid’s Club” is available every day from 1pm to 5pm.